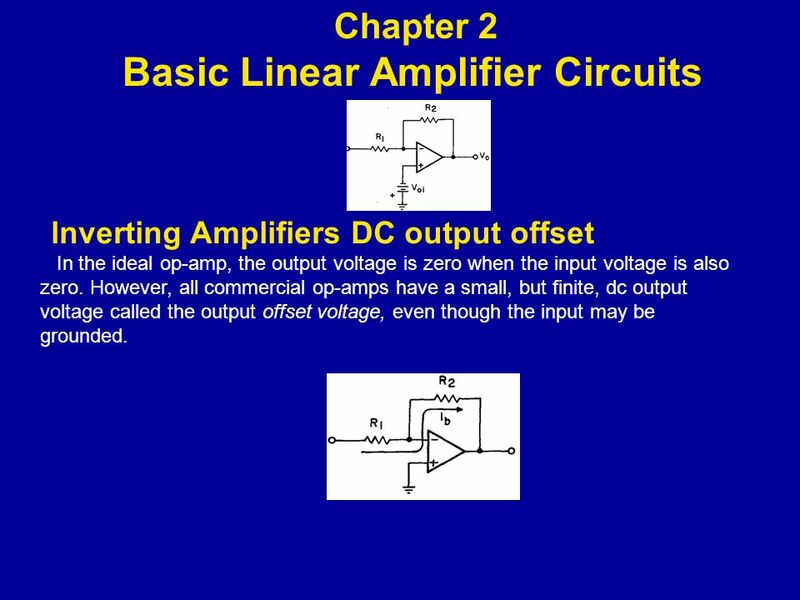 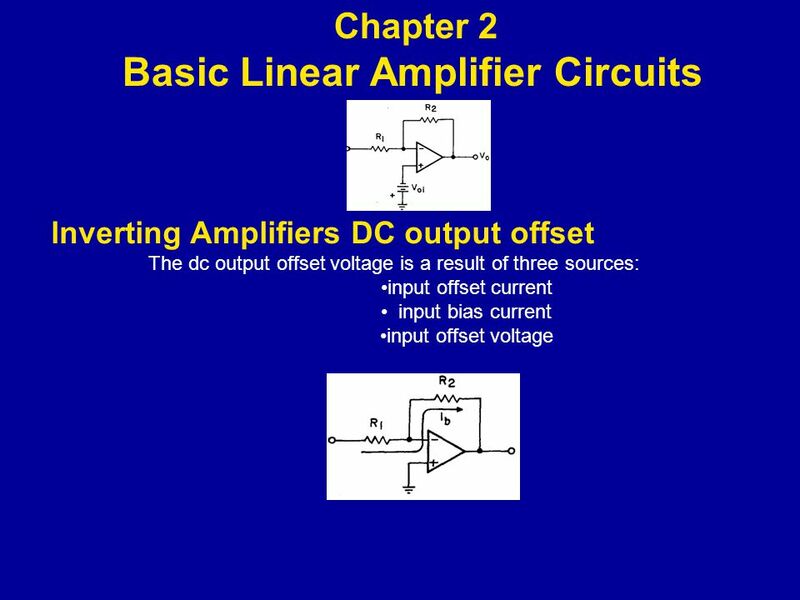 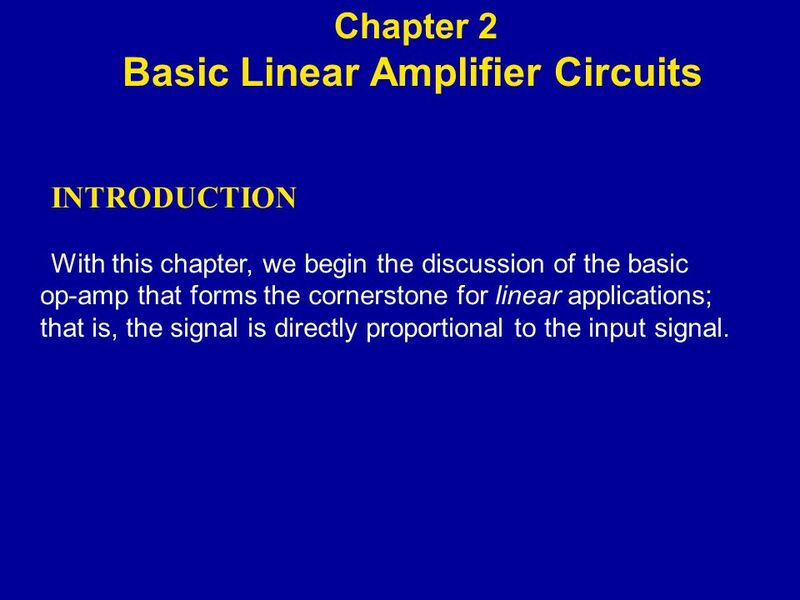 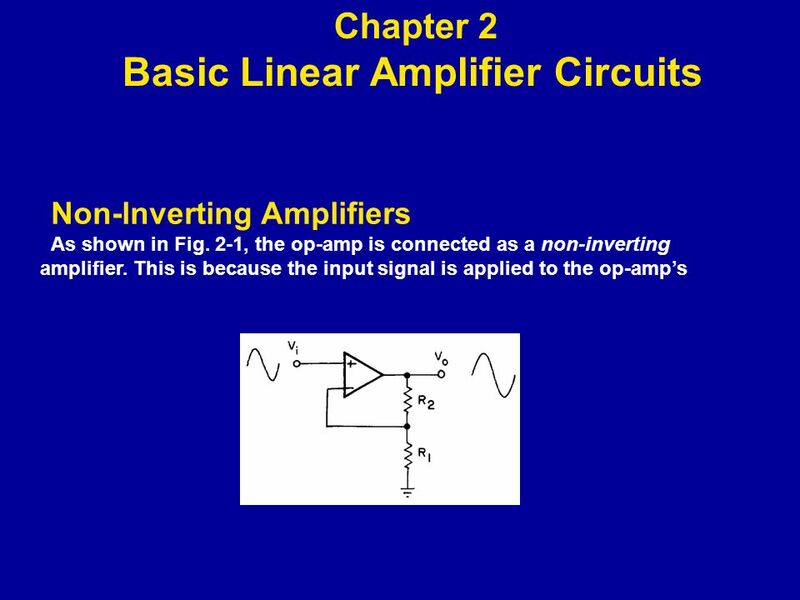 INTRODUCTION With this chapter, we begin the discussion of the basic op-amp that forms the cornerstone for linear applications; that is, the signal is. 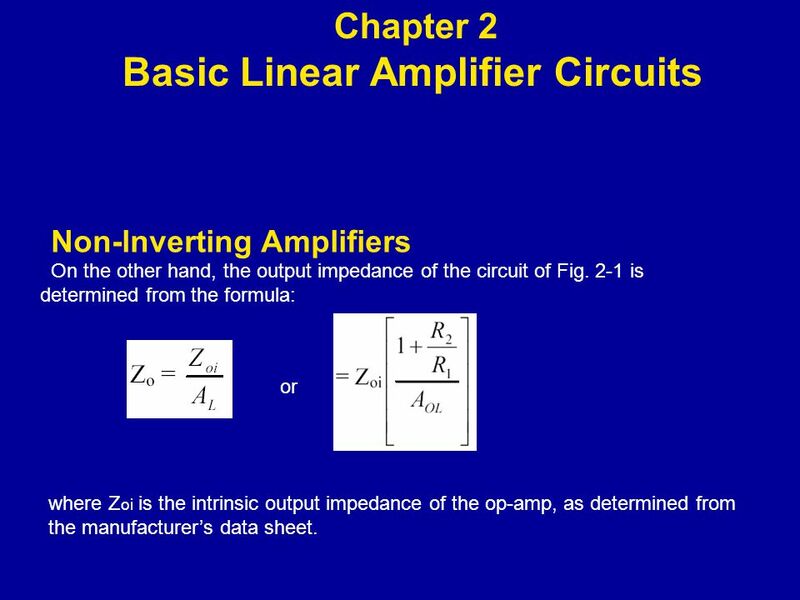 15 Non-lnverting Amplifiers On the other hand, the output impedance of the circuit of Fig. 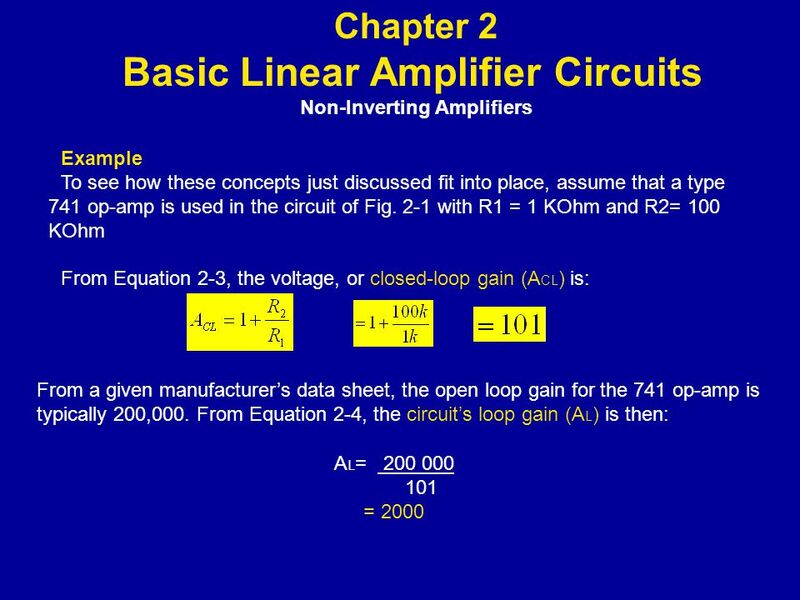 2-1 is determined from the formula: Chapter 2 Basic Linear Amplifier Circuits or where Z oi is the intrinsic output impedance of the op-amp, as determined from the manufacturer’s data sheet. 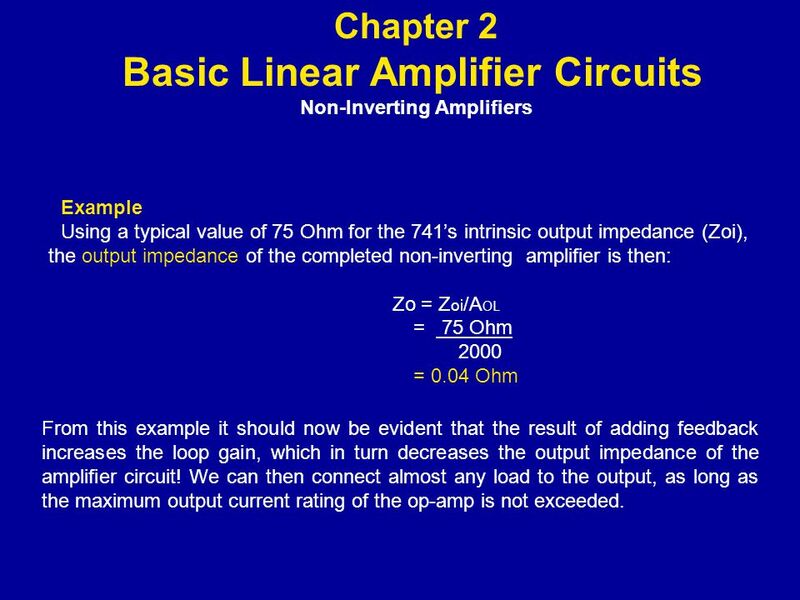 17 Chapter 2 Basic Linear Amplifier Circuits Non-lnverting Amplifiers Example Using a typical value of 75 Ohm for the 741’s intrinsic output impedance (Zoi), the output impedance of the completed non-inverting amplifier is then: Zo = Z oi /A OL = 75 Ohm 2000 = 0.04 Ohm From this example it should now be evident that the result of adding feedback increases the loop gain, which in turn decreases the output impedance of the amplifier circuit! 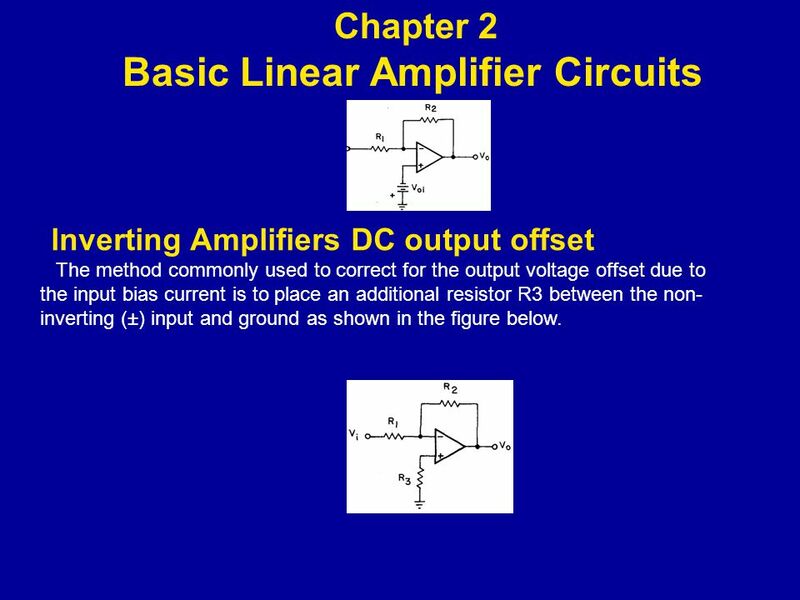 We can then connect almost any load to the output, as long as the maximum output current rating of the op-amp is not exceeded. 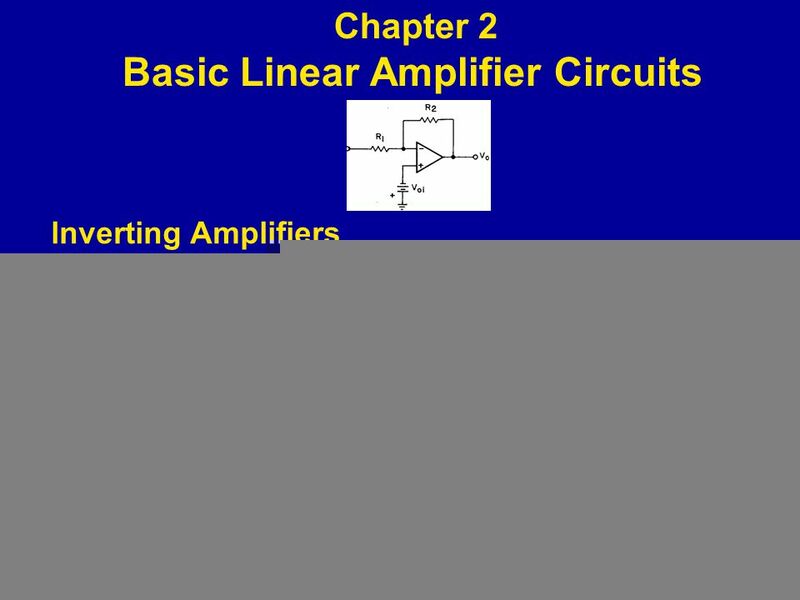 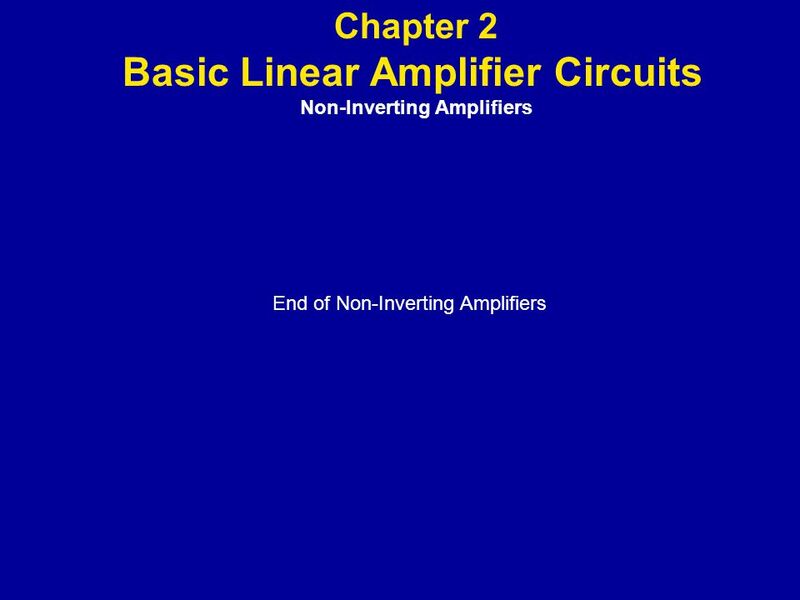 18 Chapter 2 Basic Linear Amplifier Circuits Non-lnverting Amplifiers Usually, the calculation of the op-amp circuit’s output impedance can be ignored since it is such a small number. 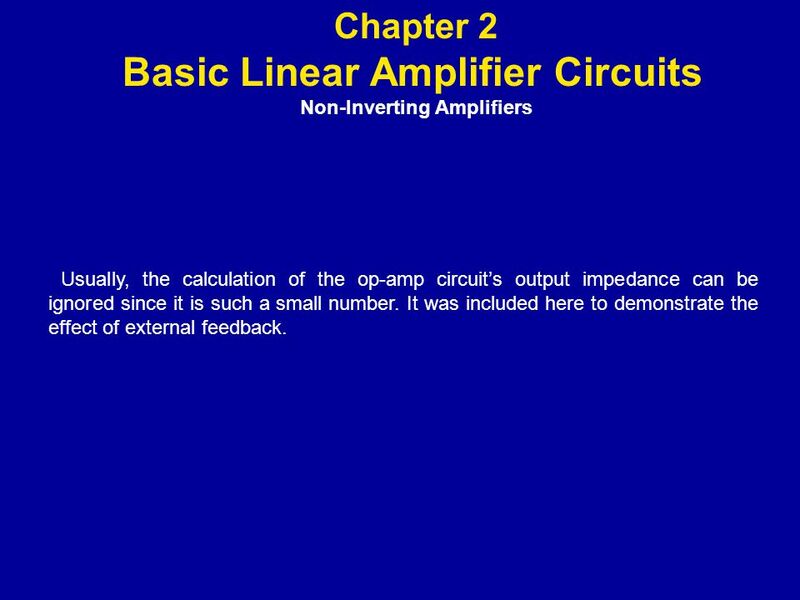 It was included here to demonstrate the effect of external feedback. 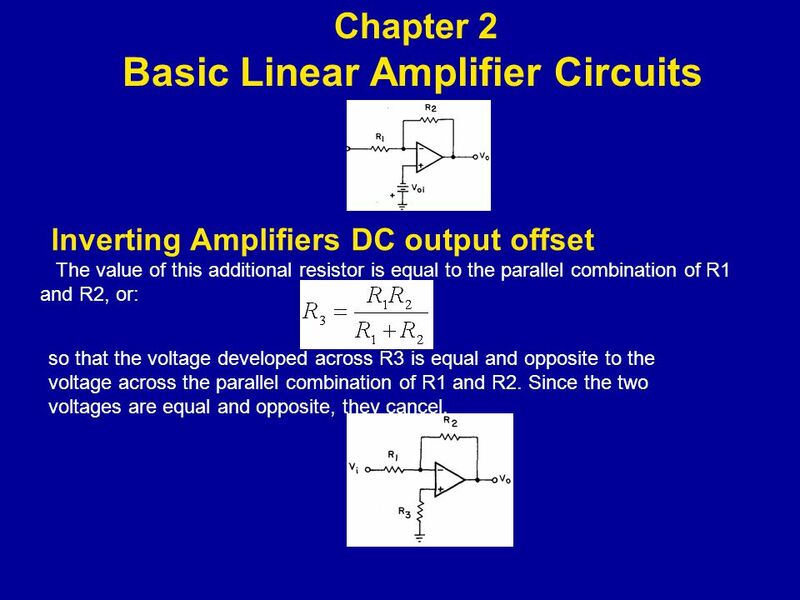 34 lnverting Amplifiers DC output offset The value of this additional resistor is equal to the parallel combination of R1 and R2, or: Chapter 2 Basic Linear Amplifier Circuits so that the voltage developed across R3 is equal and opposite to the voltage across the parallel combination of R1 and R2. 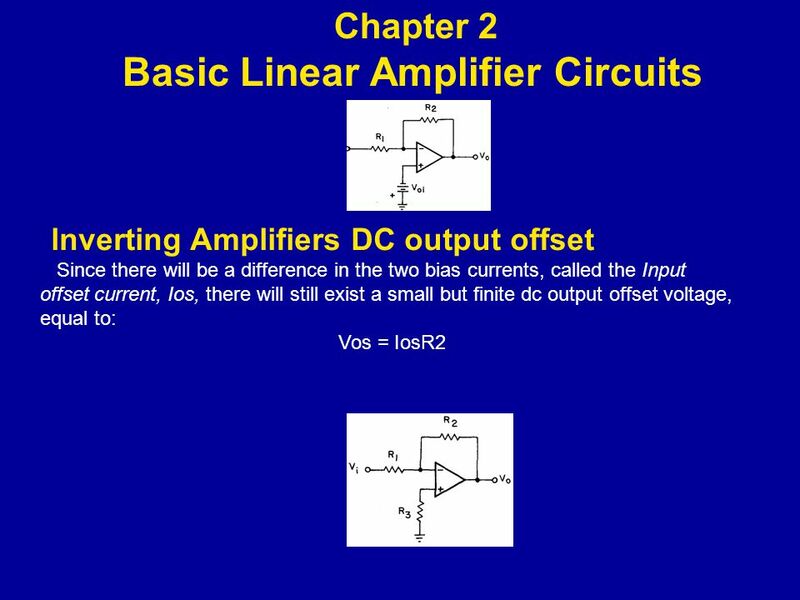 Since the two voltages are equal and opposite, they cancel. 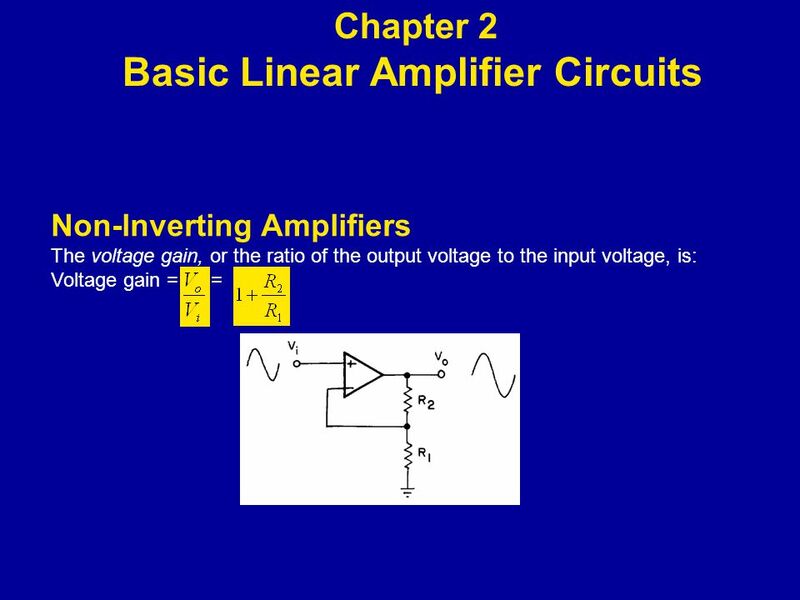 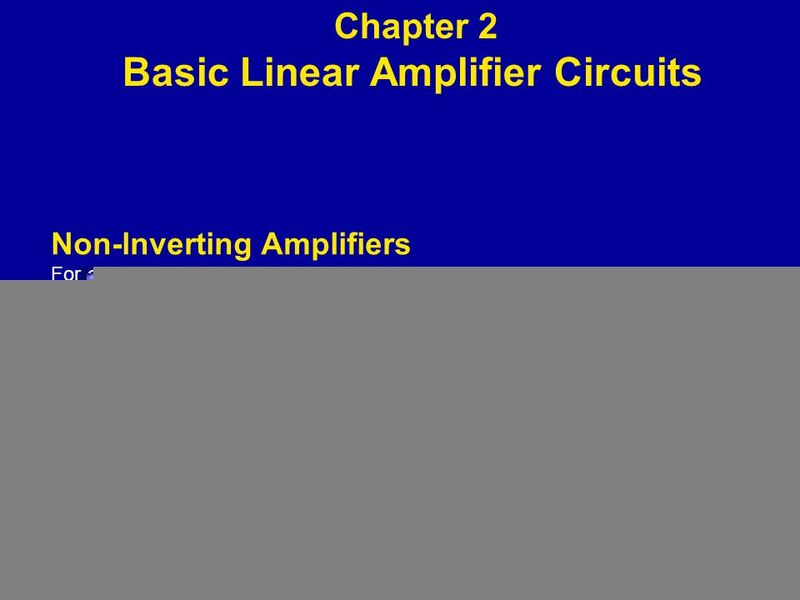 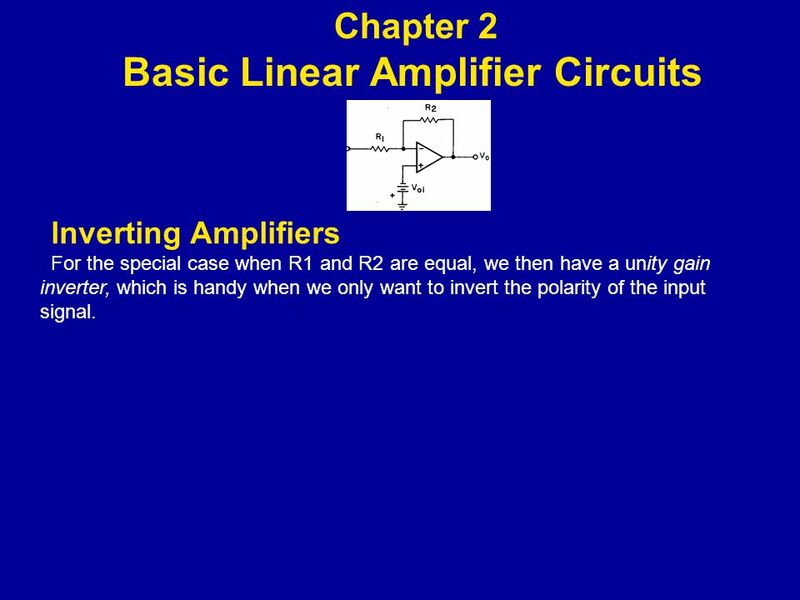 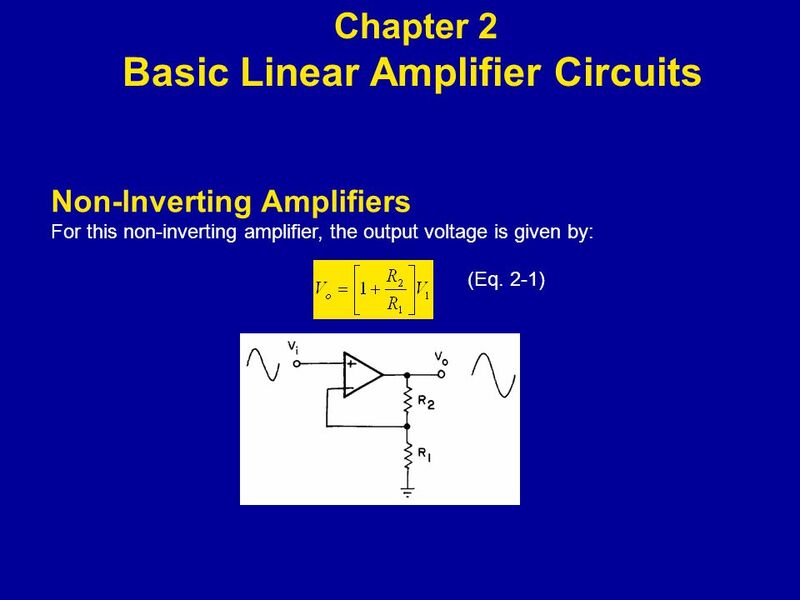 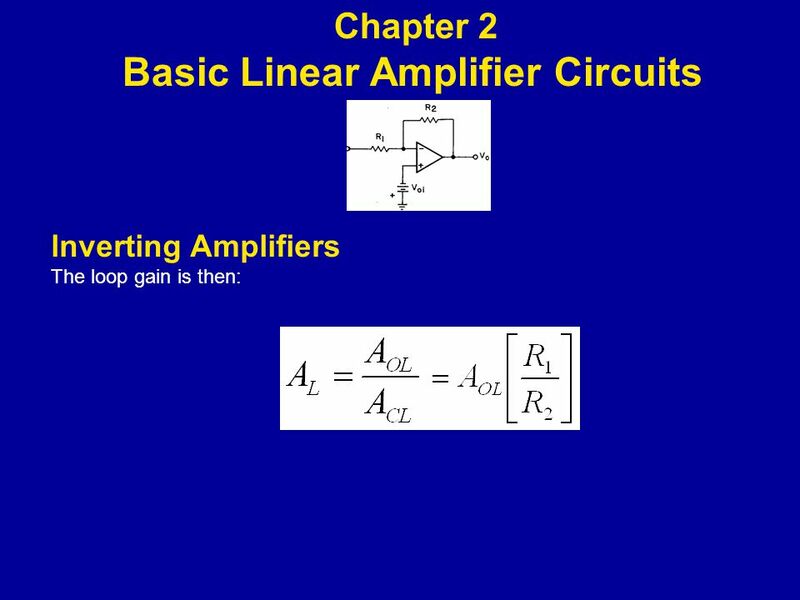 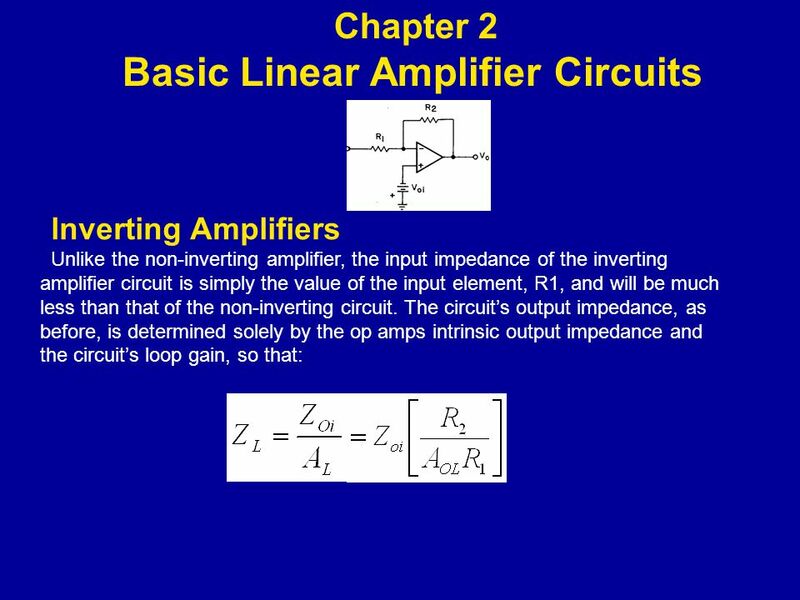 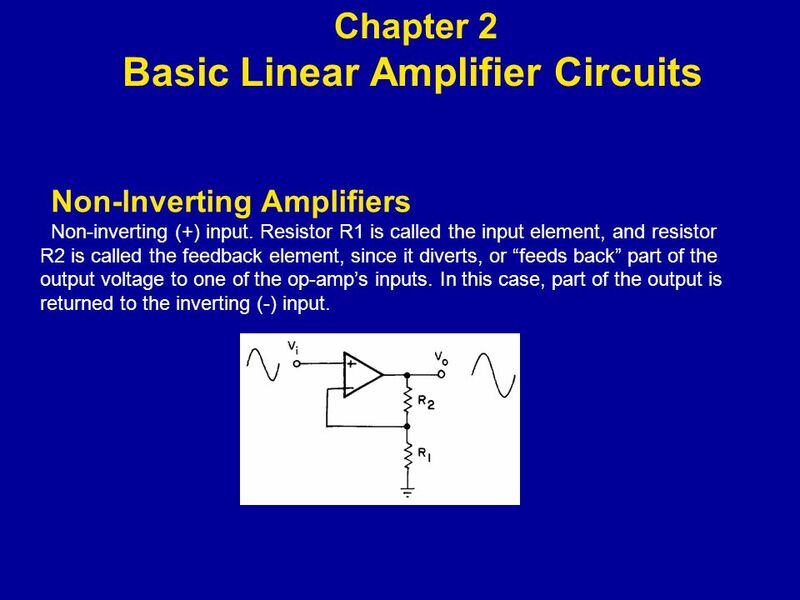 Download ppt "INTRODUCTION With this chapter, we begin the discussion of the basic op-amp that forms the cornerstone for linear applications; that is, the signal is." 1.6 Op-Amp Basics High input impedance Low output impedance Made using difference amplifiers having 2 inputs and at least 1 output 1 Note: Terminals for. 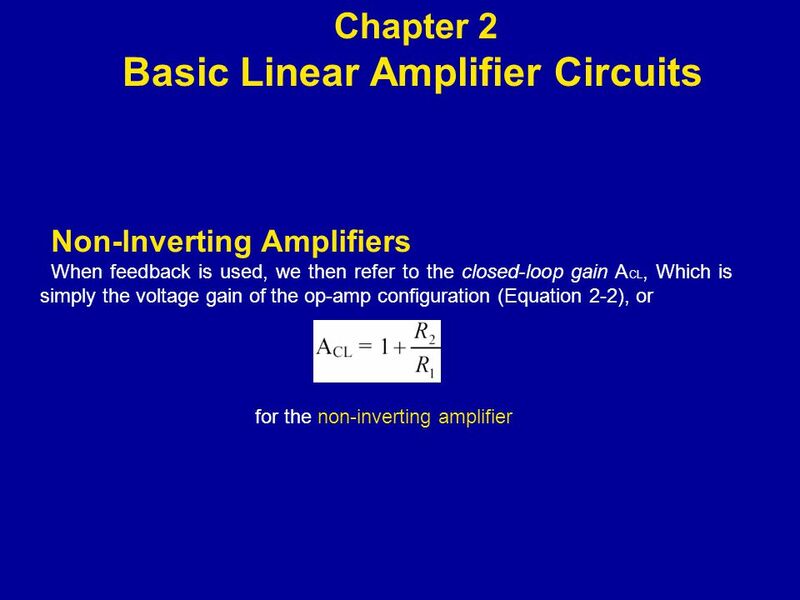 Physics 1161: Lecture 10 Kirchhoff’s Laws. 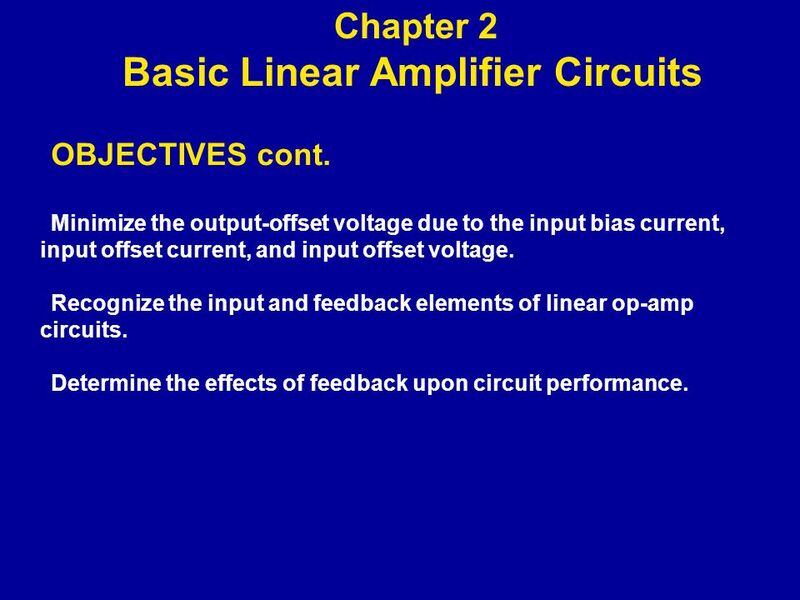 Kirchhoff’s Rules Kirchhoff’s Junction Rule: – Current going in equals current coming out. 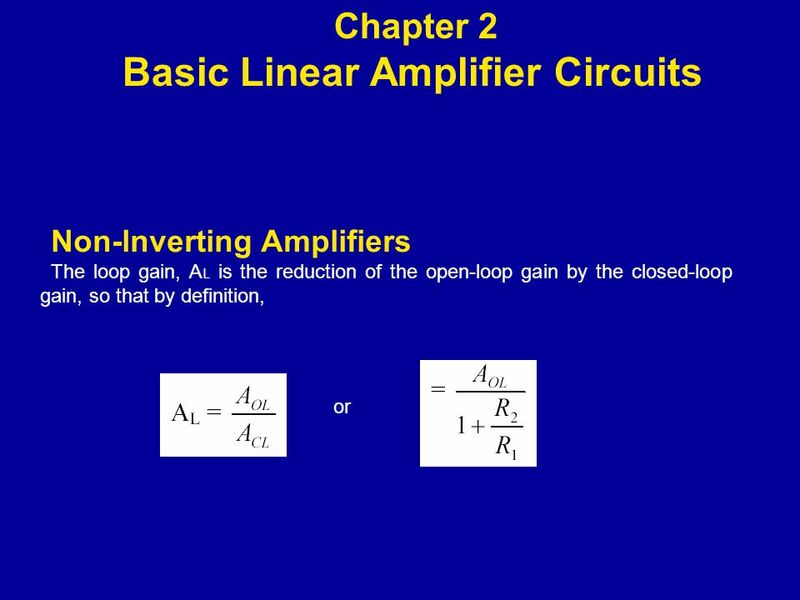 Kirchhoff’s Loop. 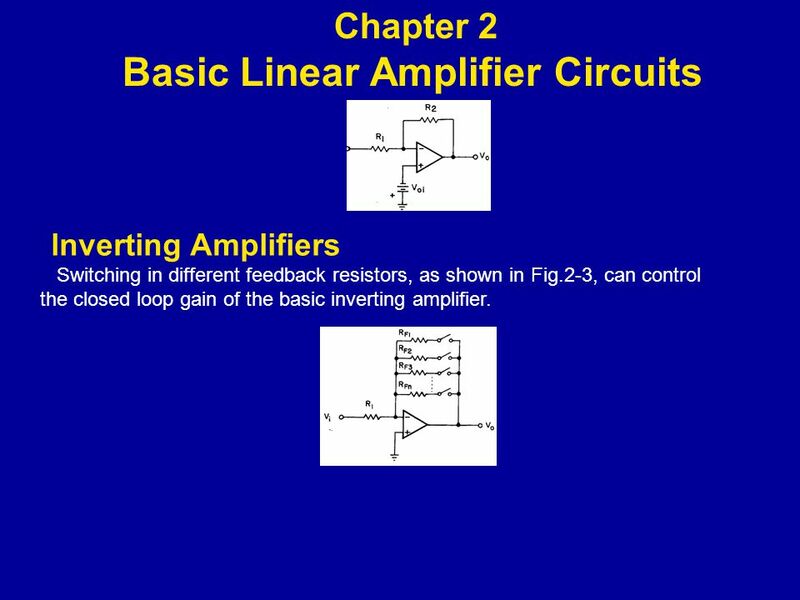 1 ECE 3336 Introduction to Circuits & Electronics MORE on Operational Amplifiers Spring 2015, TUE&TH 5:30-7:00 pm Dr. Wanda Wosik Set #14. 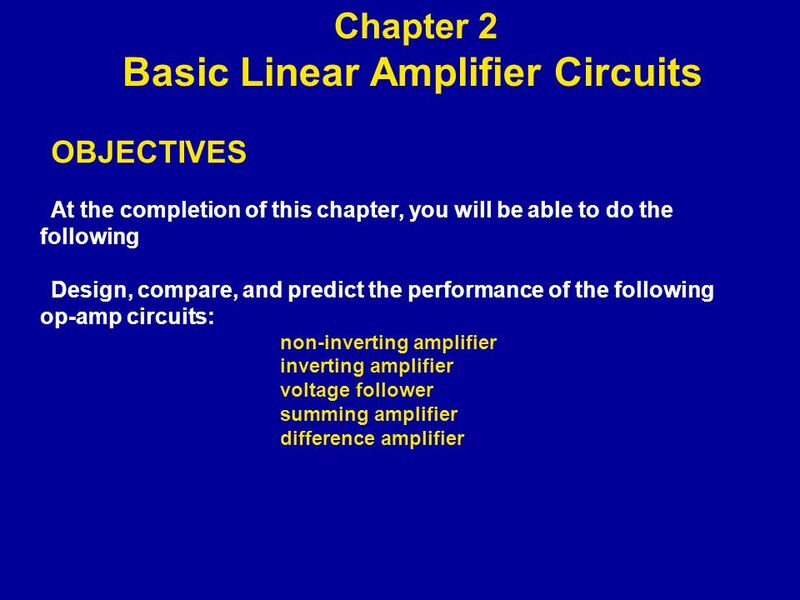 Chapter 10: Operational Amplifiers. 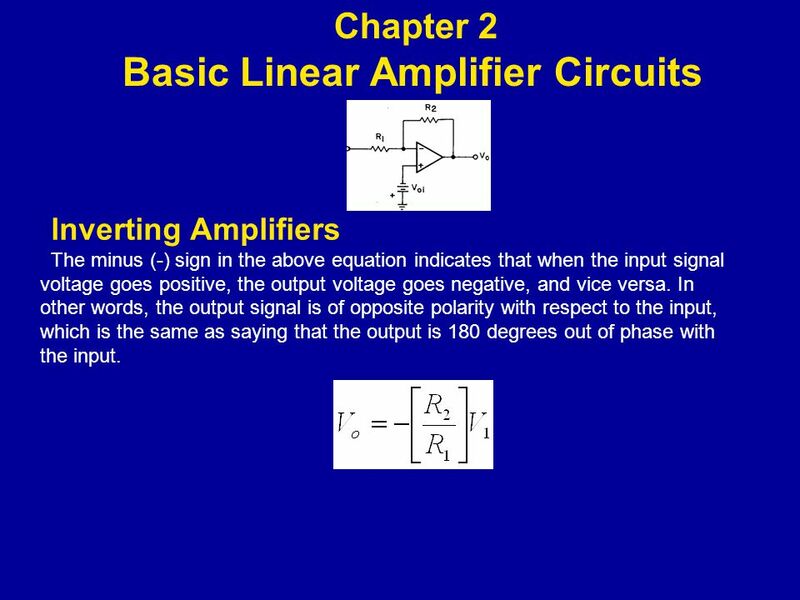 Copyright ©2009 by Pearson Education, Inc. Upper Saddle River, New Jersey All rights reserved. 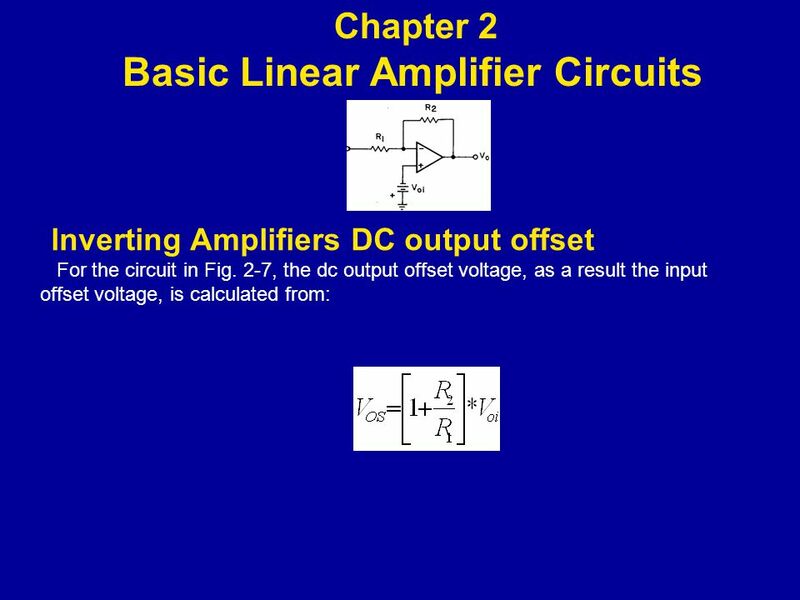 Electronic Devices.